Coprophagia - why do dogs eat poop and how can you stop it? Why do dogs eat poop and how can I stop it? Even for a confirmed dog lover, there’s no denying it’s a disgusting thing and one that’s all too common. Indeed, many a new dog owner has found themselves asking why their dog does it after watching their beloved puppy indulging in the habit. I’m talking about eating poop, of course, whether their own or another dog’s. And because of it’s nature, it’s a behavioral problem that nobody ignores. After all, it’s hard to stomach being social with a dog who you’ve just seen eating feces and now tries to lick you! Coprophagia, the technical term for this behavior, is more common in puppies, but any dog of any age can pick up the habit. And sadly, it’s not one of the most well-understood dog behavior issues. However, there have been plenty of successful techniques developed over the years to put a stop to it. So if you’re dog is eating poop, read on to learn some of the reasons why, along with some of the best ways of stopping it. Why does your dog do such a disgusting thing? Part of a larger set of behavior problems. A symptom of an underlying medical problem. In either case, a trip to the vet is probably in order. Your dog might already have a medical problem that leads to eating poop, and if that’s the case it needs solving. And if they don’t have a medical problem, well it’s likely they will develop one soon enough if you let them carry on with their habit. At the very least, you should make sure your dog’s vaccinations and anti-worm treatments are up-to-date, because coprophagia is one of the fastest and surest ways of getting worms and other diseases that thrive in feces. Feeding your dog an extremely high quality food can actually make them like the taste of their own poop. Over feeding your dog can result in them not fully digesting their food. The end result of this is that their poop still smells like food, making them want to eat it. On the other extreme, under feeding your dog makes their poop a viable source of nutrients for them, if there’s nothing else for them to scavenge. Some medical conditions, and some medicines, can affect your dog’s sense of taste and smell. Mental health problems including severe boredom can also lead to your dog eating faeces. Nutritional deficiencies may lead to the poop eating behavior as your dog attempts to compensate for the deficiency. Inappropriate levels of punishment, or unclear punishment, during house training can lead to copraphagia. It can make puppies scared and so they may eat their messes to avoid future punishment. The dog owner isn’t cleaning up the poop in the yard, so the dog is doing it instead. Copraphagia can be a learned behavior after your dog sees another dog eating faeces. It may have been a wild dog they saw. Alternatively, mother dogs will eat poop if her puppies’ mess isn’t cleared away by a human. Puppy faeces is a signal of easy prey to predators, so the mother is eating it in order to protect her puppies. Similarly to the mother dog protecting her puppies, a dog may eat a sick dog’s poop as a way of defending their pack. The smell of sickness attracts predators in the wild, seeking easy prey. Firstly, it’s important that you don’t punish your dog for doing this. As we’ve just discussed above, eating dog poop is usually either a matter of being confused or anxious about their food source, doing a job for their pack, or a symptom of some physical or mental health problem. So it makes no sense to punish any of the most likely causes. Indeed, doing so will only confuse your dog. Correct their diet if needed; don’t overfeed, don’t underfeed, and don’t feed them high fat content. Make sure you’re feeding them the best dog food you can afford. Your vet should be able to help you with this, if you’re in doubt. 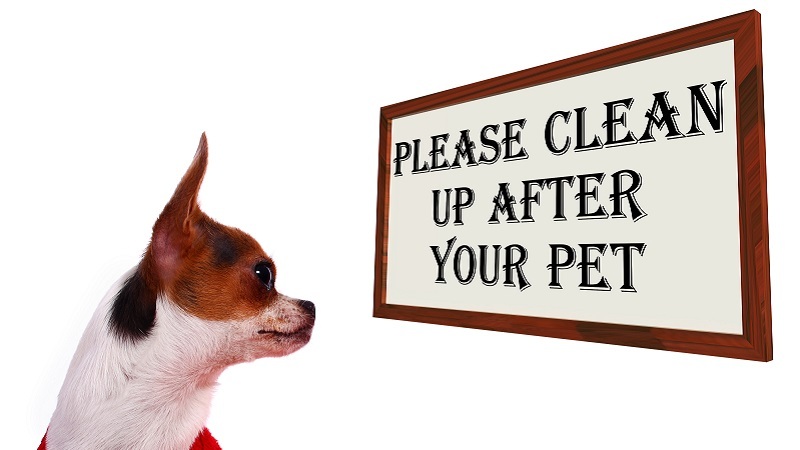 Make sure you’re cleaning up your dog’s poop as often as possible, or pay someone to do it. Give your dog some new toys. It’s possible your dog doesn’t like the types of toys they have, which can lead to boredom, which in turn may lead to poop eating. Make sure your dog gets enough exercise to fight boredom, and enough social play time with you to fight low self-esteem. Teach your dog the “Leave it!” command. If you have a healthy relationship with your dog, this will solve the problem pretty quickly. Of course, you should also make sure you solve the root cause of the poop eating as well! Try adding a small amount of pineapple to your dog’s meals. Digested pineapple is a huge turn-off for dogs and will put them off eating their poop. There are other foods that will have the same effect too. Make sure you reward your dog with praise and treats for ignoring their poop. Many pet stores sell products designed to stop dogs eating dog poop, so you could consider investing in one of these. Go behind your dog when they toilet and put a hot sauce or hot peppers inside your dog’s poop. This is sure to put them off eating it – after the first time, anyway! You can put a muzzle on your dog when in public places to avoid teaching the habit to other dogs. Hopefully this article has answered the question of why your dog eats poop. And if your dog is doing so, you’ll want to choose one or more of the above methods in order to fix the problem as soon as possible. Just remember to be consistent, and also remember not to overdo it. Too much training, too many kinds of training at the same time, and allowing yourself to give off too much sign of stress during training will all reduce the effectiveness of any kind of dog training. It’s important that you start working on fixing the problem as soon as you discover it. This is because everything that dogs do eventually becomes a habit if you don’t stop it. Last but not least, take solace from the fact that most dogs will eventually lose the habit all on their own without training. Having said that, there’s obviously no harm in helping the process along!